US meddling comes at a delicate time for Yemen, whose leaders are working on a new agreement to grant self-rule powers to the autonomous south in a move toward a more federal Yemen. The powerful Yemeni Socialist Party (الحزب الاشتراكي اليمني, Al-Hizb Al-Ishtiraki Al-Yamani), which controlled south Yemen during its period of independence through 1990, opposes the latest effort, and it continues to support a two-region state, not the six-region state that Hadi and the current Yemen government supports. If an agreement can be reached, Yemenis will vote in a constitutional referendum in February 2014. Yemen, the site of the October 2000 bombing of the USS Cole in Aden, became an immediate hotspot in the aftermath of the September 2001 al-Qaeda attacks on New York and Washington. 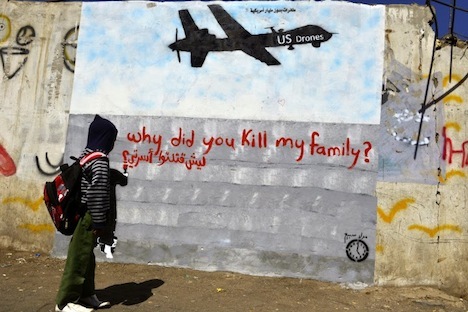 But Yemen, in particular, has been the site of several controversial strikes, including the December 2009 cluster bomb strike that killed up to 55 civilians in the remote southern village of al Majalah, and the September 2011 strike that killed US citizen Anwar al-Awlaki, on the basis of his increasingly radical call to jihad (though defying the most basic evidentiary standards or, the US government hasn’t provided any proof that Awlaki had crossed the line from radical commentary to active plotting with AQAP leaders) and the even more controversial strike that killed Awlaki’s 16-year-old son Abdulrahman, who was born in Denver, Colorado. With 25 million people, Yemen has only a slightly smaller population than the 27 million people in the much larger, wealthier Saudi Arabia to its north (and there are more Yemeni natives than the 22 million Saudi natives that reside in Saudi Arabia). But Yemen, which depends on oil for much of its economy, lacks the widespread oil reserves that Saudi Arabia and other Middle Eastern countries enjoy. Saudi Arabia produces around 10.9 million barrels of oil per day, Kuwait produces around 2.7 million and Yemen produces just 288,000. Though oil is responsible for around three-fourths of Yemen’s exports and nearly all of its government revenues, Yemen’s oil reserves are expected to be extinguished by the end of the current decade, which would bring further instability to the country. That comes on top of a demographic boom — fertility rates are high in Yemen and the population is expected to increase to 60 million by 2050. Photo credit to Yahya Arhab / EPA. Previous PostMerry Christmas, Happy Holidays, Joyeux Noël, Feliz Navidad, أعيادا سعيدةNext PostWho would win a South Sudanese civil war? Khartoum.